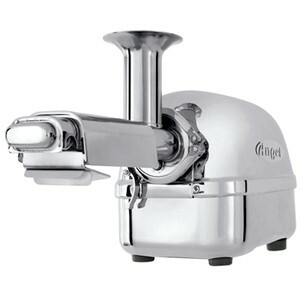 These premium twin-gear juicers are constructed entirely of stainless steel material. They are not for the faint-hearted but for serious juicers only. Juicers who juice plenty greens. 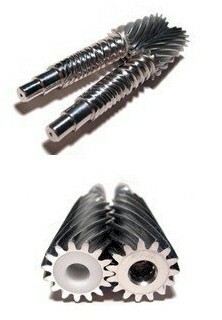 Juicaholics who have “outgrown” their single gear juicers would surely want to upgrade to these cold-pressers. 😉 Cool in every sense of the word. You would appreciate these juicers only if you’re into serious juicing. I know I would like to own a unit one day! < These models are known as the "Rolls Royce" of all juicers for their exceptional and outstanding efficiency. They are the only juicers in the world that come very close to the cold-press Norwalk Juicer that was invented by Dr Norman Walker, the “Guru of Juicing” who lived to 99 years old due to his healthy juicing practice. They operate at a slow 82-86 RPM, better than the Green Power Kempo at 160 RPM. The juicing process goes through two stages, thus making the pulp almost non-existent or extremely dry. At the first stage, the produce gets ground up roughly. At the second stage, it gets all “chewed up”, expelling very little pulp as it does its job. For these premiers, there is no mention of magnetic field and infrared waves as are the special features of a Green Power Kempo. This is something to think about, though there is no test done yet on the difference of the quality of juice extracted using either of these two different brands. 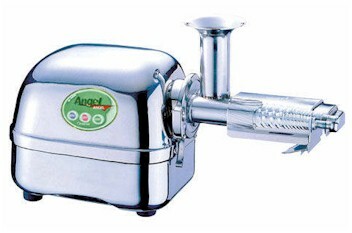 The stainless steel built alone elevates the Angel Juicers to a class above all the other juicers in the market. It doesn’t stain, is hygienic (anti-bacteria), easy to maintain, and looks new all the time! As for fruits and vegetables, it is claimed that it extracts up to 30% more juice than other (centrifugal) machines. This immediately saves you 30% on your grocery bill for the same amount of juice. Definitely more cost-effective in the long run and for life! I can imagine how sweet and concentrated the juices would be that are extracted using the Super Angels—it would definitely taste much better than the juice extracted using the single-gear juicers I own! 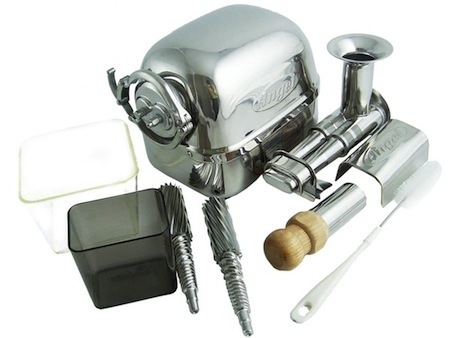 I trust that these juicers are easy to assemble and dismantle. However, as with most twin-gear juicers, I’m not too sure about the ease of operation and cleaning up. Patience is needed when using these juicers. These “Rolls Royce” juicers are not meant for quick juicing but to produce luxurious and highly nutritious drinks. You will be so pleased with the juice result that the time taken to juice would seem like a small matter. About the only negative point about these Angel Juicers though, is that they come with cheap-looking plastic collection bowls, which seem to be a common complaint. Wonder why they don’t make stainless steel bowls?? Now, the main difference between the two models? Super Angel 5500 has a manual button for reverse function, whereas sister model 7500 has an automatic reverse function. Being one who likes to be in control (ehem), I’d rather press a manual button whenever I need the reverse function, instead of allowing the machine to auto-sense the reverse function. It’s individual preference here, though. But perhaps the price might also be a deciding factor.